Commercial real estate developer Elit, LLC has begun construction on The Grove at Miramar, an upscale neighborhood retail center in the heart of the city. 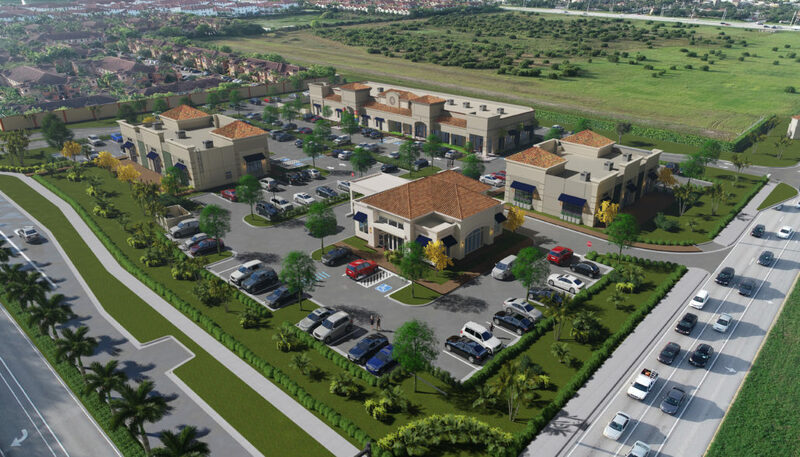 Located on 5.62 acres at the southeast corner of Miramar Boulevard and Flamingo Road, the retail plaza will consist of four buildings and up to 45,000 sq. ft. of leasable space. With multiple tenants already secured, the $15 million project is slated for completion in July 2019. The Grove will feature Mediterranean-inspired architecture, pedestrian-friendly sidewalks and lush landscaping. The buildings are surrounded by more than 200 parking spaces and will accommodate restaurants, physicians, financial institutions and more. Additionally, “Excellent accessibility to the site from both Miramar Boulevard and South Flamingo Road will allow smooth traffic flow and encourage returning customers,” said Elit co-founder Pablo E. Jeannot of ABIS Global. The Learning Experience®, one of the nation’s fasting growing early education and childcare franchises with more than 200 locations across the country, has signed a lease for 10,000 sq. ft. and Den-Vest, a leader in the design of turn-key, fully-integrated dental offices and provider of equipment and support for dental practice management and operation, has signed a lease for 1,400 sq. ft.
“One of the many benefits of developing high-quality retail space is that it attracts high-caliber tenants, paving the way for increased local economic activity and the creation of new jobs,” Taurizano added. For the project, Elit enlisted GD Construction, LLC as the builder, Gallo Herbert Architects as the architect, Whinningham & Fradley as the civil engineer, Horizon Properties as the leasing agent and Yates & Company as the land use consultant. Elit is also represented by general contracting firm GC One, Inc.
Elit, LLC is a private corporation committed to increasing value and improving conditions in Florida’s commercial real estate market. The focus of Elit is real estate investment through the development, acquisition and management of commercial properties and land. Founded by Victor E. Taurizano of Novus Realty, LLC and Pablo Jeannot of ABIS Global, Elit brings together more than 40 years of combined experience in real estate, international law, finance and investments, and architecture and engineering to create measurable success. For more information, visit www.elitdv.com.